Did you know that one in three people on every single continent in the world is affected by water scarcity? Hydros, a unique water filtration system, aims to eliminate water scarcity issues around the globe. 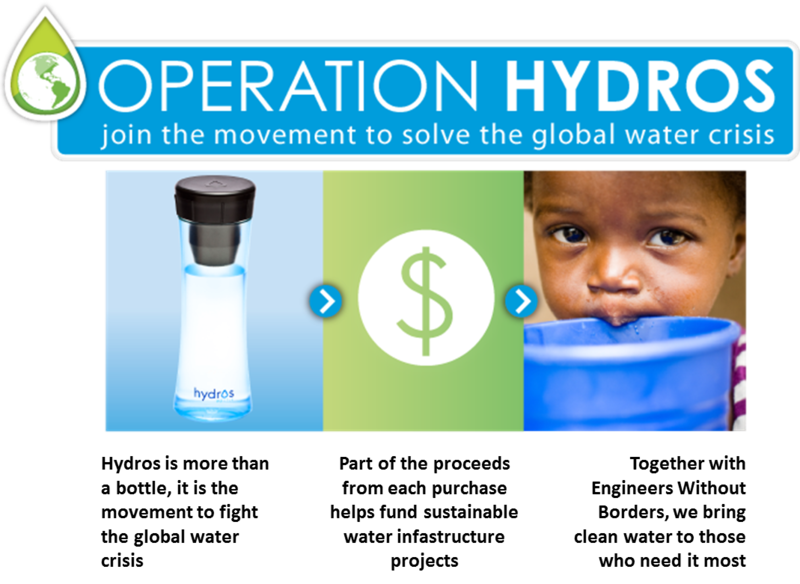 By partnering with Engineers Without Borders and donating a portion of the proceeds from each Hydros product sold, this innovative company is dedicated to building sustainable water infrastructure projects. Hydros filtration bottles are not only great for social initiatives – they’re good for consumers, too! This BPA-free, antimicrobial bottle allows consumers to safely enjoy filtered water on the go anytime, and with a side fill feature, consumers can enjoy their filtered water in style. Hydros’ social initiative and product have been featured in the media numerous times. Appealing to a wide audience, Hydros water bottles have been featured in Technically Philly, Daddoes, Elite Mamas, and were even recently included in an article by Forbes! If you’d like to learn more about Hydros, head to their Fundable profile here.